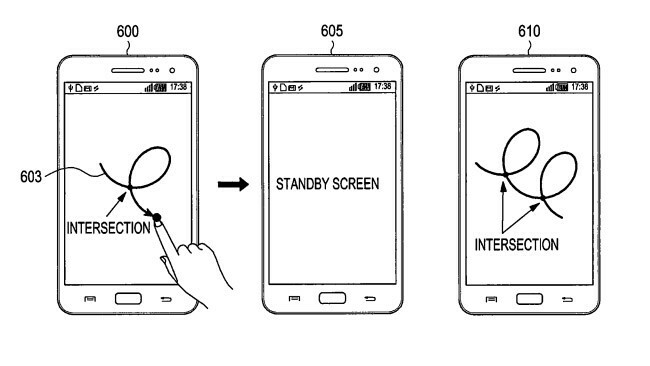 Samsung just listed a new patent for a new method to unlock your device. This new feature will be able to unlock a phone by drawing a shape on the display with at least one intersection in it. It’s a more artistic feature than Nokia’s double tapping one the new MeeGo OS. 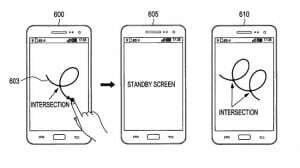 If you were bored to press the home button or the unlock one, this patent is for you. According to the patent information, the shape that you are drawing must have at least one intersection, but it can be bigger or smaller. But that’s not all folks. Samsung used us with all kind of complex features, so this new one will be able to launch an app by drawing a specific pattern for it. In the end, it seems that this pattern is a new more customer oriented feature from Samsung. It will be added to Samsung’s devices software somewhere around the rod to make customers life more easier and simpler. Maybe it will appear til the end of the year on a new tablet or smartphone. Definitively, this will be an interesting feature to test. What do you think about it? Do you like it? Are you willing to draw things to unlock your phone? We definitively will !